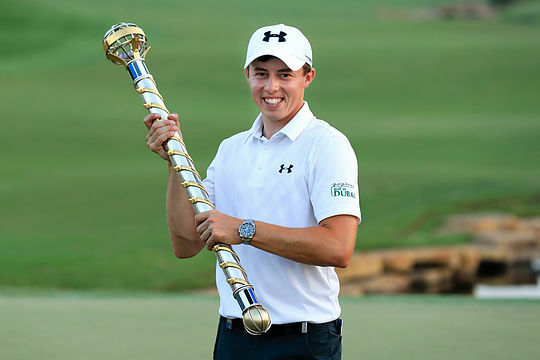 Matthew Fitzpatrick buried any lingering Hazeltine demons after capturing the season-ending DP World Tour Championship in Dubai. Fitzpatrick, 22 collected just the third event of his pro career in what proved to be a two-shot turnaround in his favour at the last, when he holed a four-foot birdie while fellow Englishman Tyrrell Hatton, who had been leading by a shot heading to the 18th tee, proceeded to bogey the hole. Fitzpatrick posted a final round 67 for a 17-under par victory tally and one few than Hatton who carded a 68 in the Greg Norman designed Earth Course. The 22-year-old becomes the youngest Englishman ever to win three European Tour titles beating out six-time major winner Nick Faldo, who was roughly six months older when he won his third European Tour event at the 1980 Sun Alliance PGA Championship. Scott Hend closed out his 2016 European Tour season with a T40 finish to sit at 27th place in the Race To Dubai with €1,266,775. Marcus Fraser was the only other Australian in the field this week but second and third rounds of 74 and 78 saw the Olympian finish in equal 52nd place. While Sweden’s Henrik Stenson didn’t win this week he performed well enough to clinch his second Race to Dubai title and end 2016 as the European No. 1. The Open champion closed his 16th European Tour season with a seven under par 65 in the DP World Tour Championship, bringing the curtain down on a year in which he became the first Swede to win a major with his triumph at Royal Troon in July and also claimed an Olympic silver medal. Along with victory at Royal Troon, Stenson won the BMW International Open in Germany and finished runner-up another three times this season.